Being a pilot is one of the top dream jobs. I myself dreamt of being one when I was a kid. I was fascinated by remote-controlled airplanes and helicopters. Now, as a travel blogger who flies regularly, I appreciate pilots even more. The job of a pilot is thankless. It is risky, but prestigious. With the prestige comes a hefty price tag, unfortunately. The Philippines’ leading carrier, Cebu Pacific launched its Cadet Pilot training program aimed at addressing the airlines expansion requirements over the next five years. The program, to be conducted in partnership with Flight Training Adelaide (FTA), will create 240 professional pilots who will subsequently join the corps of pilots of Cebu Pacific. The Cebu Pacific (CEB) Cadet Pilot Program is a 56-week program that recruits candidates from ab initio, and puts them on a 56-week integrated flying training; flight theory and education course to become licensed Commercial Pilots. After completion of the program, the cadet-pilots become First Officers at Cebu Pacific, and join the corps of aviators at Cebu Pacific, flying domestic and international routes. 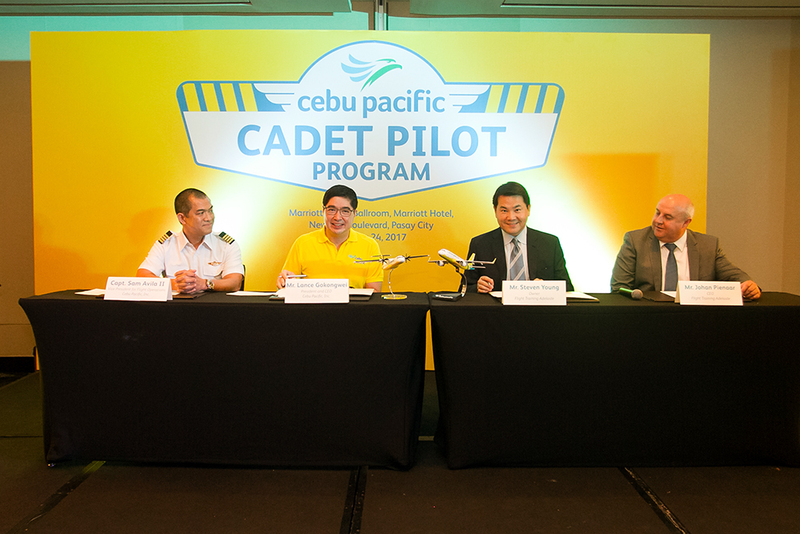 Cebu Pacific will be investing a total of 25 million US dollars over a five-year period for this Cadet Pilot Program. “The Cebu Pacific Cadet Pilot Program will enable everyJuan to achieve the dream of becoming a pilot. This program will allow us to train homegrown Filipino pilots with best-in- class international standards. The candidates need not worry about shelling-out money for tuition to flying school to achieve their dream. Cebu Pacific will shoulder the cost first and expose candidates to one of the best pilot training facilities in the world. Through this program, we aim to have continued access to a pool of highly skilled aviators that would support our growth,” said Lance Gokongwei, President and CEO of Cebu Pacific. Cebu Pacific has a current fleet of 59 aircraft, comprised of comprised of one Airbus A319, 35 Airbus A320, eight Airbus A330, eight ATR 72-500, and seven ATR 72-600 aircraft. Between 2017 and 2022, Cebu Pacific expects delivery of seven Airbus A321ceo, 32 Airbus A321neo, and nine ATR 72-600 aircraft. The Cebu Pacific route network, including that of subsidiary Cebgo, reaches 37 domestic and 25 international destinations, with over 100 routes. Cadet-pilots are enabled to study and train at flight school now, and then they can amortize the payment for the course while they are employed. The entire program will be financed by Cebu Pacific, with successful cadet-pilots guaranteed employment with Cebu Pacific upon graduation. They will then pay for the cost of the program through salary deduction over a maximum of ten years. Sixteen candidates will be chosen per batch, with Cebu Pacific sending three batches of cadet-pilots per year. The screening process for applicants begins with an online screening, followed by an on-site screening for core skills and pilot aptitude tests, among other examinations where a fee of AU$425.00 (PHP17,000.00) will be charged. Cebu Pacific and FTA will jointly select the final list of candidates. The successful candidates will then be sent to the FTA campus in Adelaide, Australia for 52 weeks. There, they will undergo learning modules and training and earn diplomas in Aviation. The cadet-pilots will then move on to training on a flight simulator, and then flight time on an actual aircraft, to complete the licensing requirements to become a Commercial Pilot. The cadet-pilots then return to Manila for a four-week training to obtain a Pilot’s License under the Civil Aviation Authority of the Philippines. The program is open to all Filipinos who are college graduates, proficient in English and hold passports valid for at least two years prior to the start of the program. to be completed by December 2017. Interested aspirants may apply at http://bit.ly/CebCadetPilots.